On September 11, 1915, John Henry Battison, the founder of the Society of Broadcast Engineers, was born. When he died on August 28, 2012, the society and broadcasting said farewell to a great broadcast engineer. On what would have been his 100th birthday, the Society of Broadcast Engineers shares some of his ideas and memories. The Society owes its creation to John. When he was the editor of Broadcast Engineeringmagazine, he penned an editorial suggesting a new organization was needed to fulfill the needs of the station-level broadcast engineer. When no one stepped up to the challenge, John took it on himself to see it through. John Henry Battison has played a significant role in the radio industry. From working in radio stations to founding the Society of Broadcast Engineers in 1963, he was a source of creativity and experience. From 1978 to 1985 Battison held several management and engineering positions. He was the director of engineering and general manager of CHCTTV in Calgary, AB. He became director of television, produced Burl Ives on ABC Network and produced two weekly shows on Dumont, CBS and NBC. In 1947-1949 he worked for ABC New York, where he planned and designed four network TV and FM stations. In 1968-1970 he worked in Saudi Arabia, Riyadh as chief engineer of Saudi Television. These 56 years of broadcast have provided input to dozens of stations, and these aren’t all his accomplishments. Battison was also a consultant. He was a consultant for Bing Crosby from 1961 until going to Saudi Arabia in 1968. He was also a consultant to former Governor of New Mexico John Burroughs from 1960-1962. Battison became a TV consultant, planning TV studios, for American University, Washington, DC, from 1952-1954. He has lectured on broadcasting at New York University, American University and in 1952 became the director of education for the National Radio Institute in Washington, DC. Known in broadcasting circles as the authority on directional transmitting antennas, he taught at five of the six special directional antenna seminars given by the NAB. In March of 1980 he became a U.S. member of the FCC delegation attending the Region II, Medium Wave World Administrative Radio Conference in Buenos Aires. In 1979, he was selected to travel to Moscow as the U.S. delegate at the Popoff Conference. ■ Belgium: Battison was invited to be a guest lecturer on the subject of design of interactive television and CATV systems, at the University of Liege, International Conference in Nov. 1980. ■ Bahrain: Battison planned the national TV system in this country as well as a high-power radio station. ■ England: He was director of engineering for Associated Redifussion, which was the largest commercial TV operation in England. ■ Lebanon: From 1976-1978 he was a consultant to the government in connection with two high-power direction FM stations and the new National Television system. ■ Yugoslavia: Battison designed 1,200kW directional antenna system. ■ Uganda: In 1962, He was a consulting engineer helping to plan the country”s national TV system. ■ China: He lectured at Peking Institute of Broadcasting in Peking, China, in May 1981, as an official guest. Other achievements include being the author of 15 technical books and more than 500 technical articles in technical journals. From 1964 to 1967 he was the editor of the Journal of Society of Broadcast Engineers. He is a former editor of Broadcast Engineering, a contributing editor for Public Telecommunications Review and former technical editor of Radio magazine. Battison was recognized with the SBE Lifetime Achievement Award in 2006. 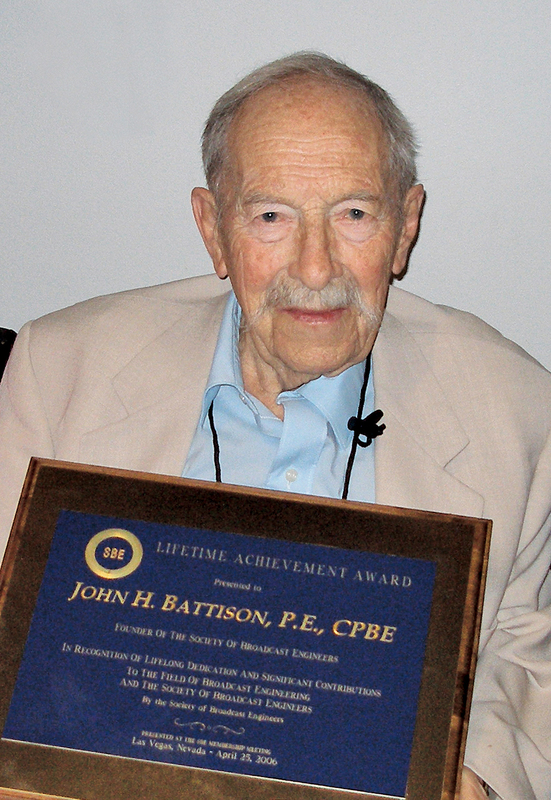 On Apr 12, 2011, at the SBE’s annual spring membership meeting, SBE President Vinny Lopez, CEV CBNT, announced that the SBE Lifetime Achievement Award was renamed the SBE John H. Battison Award for Lifetime Achievement. On Sep 11, 2012, Battison’s 97th birthday, he was memorialized with the creation of a scholarship in his name. The John H. Battison SBE Founder’s Scholarship is now presented to an applicant who seeks to enter or advance in the field of broadcast engineering. In the December 1961 issue of Broadcast Engineering, John Battison, then the editor, wrote of his dismay that while the focus the Institute of Radio Engineers was important, that focus had shifted away from the needs and interests of the regular station engineer. He cited the proceedings from a recent convention were too sophisticated for station engineers. He proposed forming a new group to serve the needs of the station engineer, and the seeds of what would become the Society of Broadcast Engineers were sown. The Eleventh Annual Broadcast Symposium of the Professional Group on Broadcasting of the Institute of Radio Engineers (IRE) has just been held in Washington, DC. Approximately 300 top engineers attended from all over the country. As a result, many good ideas and new concepts were exchanged. When the IRE was first founded it was composed mainly of radio men, engineers and technicians, who were actively engaged in the art and science of communications per se, which ultimately led to radio and television broadcasting as we know it today. But in the many years that have passed since IRE’s birthday the picture has changed, and today radio broadcasting plays a very minor part in the activities of the Institute. The steering committee of the IRE became cognizant of this, and some years ago in an effort to retain members whose interests were broadcast engineering only, formed the Professional Group on Broadcasting. This is now one of nearly 20 other so-called professional groups of the IRE. But even with this sop to the original aims and composition of the IRE, more and more broadcasters are notfinding what they want in the IRE. The Proceedings is far too sophisticated for the average radio engineer, and even for the many of the engineers who hold higher degrees. So what is left for the station man? The irregularly produced issues of the papers of the various Professional Group meetings! These fill a very small part of the vacuum left by the lack of broadcast meat in the IRE menu. Possibly a new institute is needed for broadcast engineers, one started in just the same way as the IREwas originally? Perhaps it should be called the IBE, Institue of Broadcast Engineers, and be presided over by one of the great broadcast engineers of a few years ago? How many years is it since a broadcast engineer was president of the IRE? We leave you that thought this month. Your comments addressed to the Editor will be welcome. In 1986 John Battison wrote an article in Broadcast Engineering called “Making History” in which he made predictions about the future of broadcast radio. Here are his predictions, followed by comments on the actual state of these topics now. 1986 – Cellular telephones are obviously going to play an increasingly large part in our lives and in the development of personal portable telephones. These phones have been available for years, and many engineers have had 2-meter rigs in their cars for some time. However, cellular radio will make phones far more efficient and attractive to the general public. 2015 – They’re not just phones anymore: They are media players, cameras, Internet browsers and broadcast receivers. 1986 – Stereo broadcasting: We’ve heard quad stereo and I, for one, have been unimpressed by it. Now we have stereo AM. That technology seems a little more impressive, but I can’t help wondering how far it will go in the future. Will it really do that much to boost sagging AM radio ratings? 2015 – We know that AM stereo never really took off. There are a few market-leading stations, but AM ratings are not what they once were. 1986 – Subcarriers: SCAs are old hat by now. The only recent change is that the commission has now increased the number of channels that may be carried on an FM carrier. Similar control systems can be carried on AM. AM still cannot do as much as FM in the way of providing ancillary services on a carrier, but AM-SCA can certainly provide a means of increased revenue for an astute operator. 2015 – SCAs have changed little since then, although digital methods have given some stations new uses. Multicast capability on FM HD Radio is today’s modern equivalent to the 1980s SCA. 1986 – Radio control: Children are now playing with radio-controlled airplanes, and I recently saw an ad for a radio-controlled submarine. UHF propagation is so much better understood than it was 30 years ago, and is being used in ways undreamed of in 1950. Unfortunately, the mobile radio interests are dreaming of unused UHF channels for communication purposes. This is something that all UHF operators should watch closely. 2015 – Everyone wants a piece of the spectrum used by broadcasters. TV stations are fighting the white spaces and 2GHz encroachers, while terrestrial radio is struggling with low-power services. 1986 – Digital: The catchword today is digital, and everyone is climbing on the band-wagon. Digital techniques certainly offer freedom from noise and allow international compatibility. As the industry develops additional standards, further use of the technology will take place. Computers are almost commonplace today. We have passed the era when people saw the computer as a vade mecum, or a universal panacea, and purchased thousands in high hopes of gaining a third hand. However, as the wild enthusiasm levels off, computers are becoming more and more a part of our daily lives. Self-repairing and operating equipment and robots are also on the horizon. 2015 – Digital is still the catch word, but we know how to use it better. The enthusiasm over computers hasn’t really waned, but it has matured. No one can imagine life without the Internet today. Self-repairing equipment? In some ways, yes. Robots? Not yet. In 1998, John Battison was awarded the NAB’s Engineer of the Year Award for radio. The acceptance speech he delivered to accept the NAB award outlines part of John’s amazing career and illustrates perfectly to the industry’s relative newcomers just how far we’ve come. A transcript follows. Good afternoon NAB, fellow engineers, ladies and gentlemen. Thank you National Association of Broadcasters and my sponsor for this honor. I’m very proud to receive it. I finally retired this spring, and it’s 1000dB nicer than a gold watch. Looking back over 52 years of broadcast engineering, I want to thank all the people who have helped me. Among these are Frank Marx, who hired me in the ABC Engineering Department, and especially Carl Smith, who has been a very good friend for most of my engineering life, as well as a fine employer. Television came to life when ABC received its TV CPs, and we had to find a TV studio site in New York. We decided on the old riding stables just off Central Park. Then we had to get rid of the birds and the horse’s souvenirs. We had hoped to put the WJZ-TV transmitter on the RCA building. In the interim, we put it on the Pierre Hotel and got a horrendous ghost on Westchester County. As time passed, AM became “ancient modulation” and FM became the “forgotten medium.” Eventually, FM took hold and we engineers pretty well filled up the New England area with FM stations. In 1961, in a Broadcast Engineering magazine editorial, I urged the creation of a broadcast engineering society. I received lots of support. In 1963, I personally wrote to every radio and TV chief engineer — about 6,000 letters — proposing that we start one. In 1964, NAB gave us space in the Chicago Convention; about 100 engineers turned up. I was made steering committee chairman, and the Society of Broadcast Engineers was formed. We published a quarterly SBE journal with a lot of member input. We had great industry support and led off with a greeting from the FCC chairman. In 1965, I was elected president. We had about 400 members and eight chapters around the country. I handed [the reigns] over to Charlie Hallinan as president in 1966, and the SBE never looked back. Also in the sixties we had the “10% Rule,” which allowed us to build new AMs – provided there was not more than 10% interference! Finally, the FCC imposed an AM freeze to undo the mess that AM was in. Then there was a burst of activity from the daytimers, and Ray Livesy headed up another attack on the FCC to liberalize night operation. This resulted in some strange night powers ranging from about six Watts to several hundred. Many small towns received some level of new, local night radio service. Sometime during this period, AM stereo came — and went — mainly through FCC vacillation. By the way, I liked Leonard Kahn’s system best. The US participated in the Region Two World Administrative Radio Conference in Buenos Aires in 1980, and I was honored to be a member of the FCC/Industry team. We went down to the conference with strict orders from the FCC to plug for nine kc AM separation. After being in Buenos Aires for about four days, we had succeeded in persuading many other delegations from the Americas that the change was good. The we suddenly received orders from the FCC to forget nine kc separation! With rather red faces, we had to change horses midstream and persuade them to switch back to 10kc. The FCC introduced the “standard” antenna pattern. It replaced the old MEOV that was the consulting engineer’s lifeboat when a pattern wouldn’t come in. The end of the eighties saw LPTV come into bloom, and CPs were issued by the hundreds – but not all were built. By this time, engineers in radio stations were a thing of the past. “Five-week winder” First Class Licenses made DJs into engineers, and remote control took over many of the operations. Automated transmitter operation and reduced FCC logging requirements were introduced, and only high-power and directional AMs had to make log readings every three hours. I wonder how many remember the days of logging transmitter readings every half hour? Or logging base currents daily? It’s quite different today. So different, in fact, that we don’t need licensed operators any more. Unfortunately, the pirate broadcasters think they don’t need licenses either! The AM band has been expanded to 1710 kc, and a few new stations are on the air. We’ve advanced from the Conelrad system, through EBS to EAS. This still has problems, but no doubt, eventually, it will work as planned. Perhaps the greatest change has been the introduction of a piece of rare metal contaminated with an exotic oxide. I’m referring, of course, to the transistor. This little device has changed radio engineering. First came transistor radios plugged in to the world’s ears. Then came its big brother: the transmitting transistor. Transmitter manufacturers switched from tubes to transistors as fast as new methods of RF power generation were developed. The old, single-modulated channel, Class A, triode AM transmitter has developed into multi-channel units list its FM brother. Satellites are offering direct multi program sources, and the days of the crystal receiver and headphones are numbered! When the digital revolution hit radio, its amazing versatility spawned new transmission methods. Almost every day we hear of new ones. Spread spectrum, once top secret, has given us legally unlicensed STL operation with low power and low cost. Radio engineering’s advances from 1945 through 1998 have been fantastic. Someone will say, “He’s forgotten – whatever.” I apologize. Too many things have happened to cover them all. NAB, fellow engineers and ladies and gentlemen: I thank you. At the 2012 SBE National Meeting, Chriss Scherer, CPBE CBNT, past president of the Society of Broadcast Engineers, presented a tribute to John Battison. The presentation received the 2013 SBE award for Best Technical Article, Paper or Program by an SBE Member. View this video on the SBE’s Youtube Channel. Watch the touching tribute to John Battison presented by Radio magazine Editor Chriss Scherer CPBE CBNT, editor of Radio magazine and past president of the Society of Broadcast Engineers at the SBE Awards Banquet at the 2012 National Meeting in Denver on October 24, 2012. 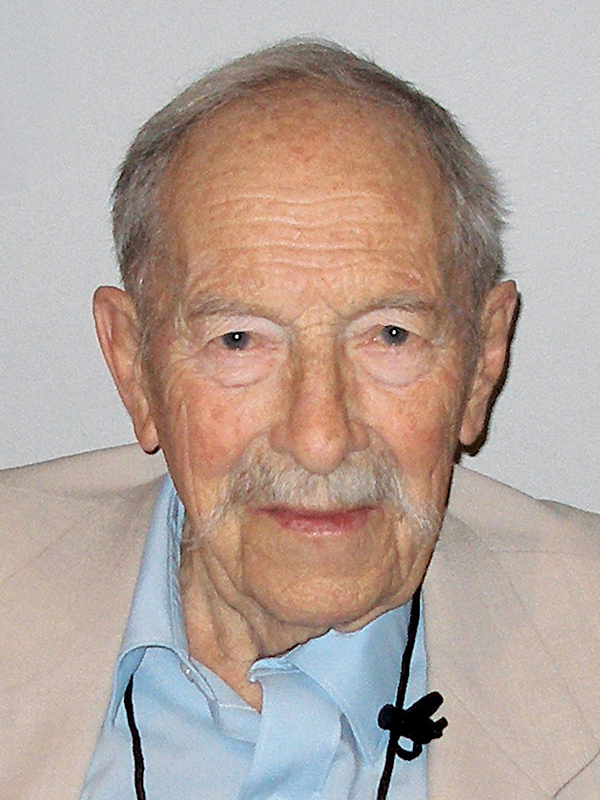 Battison was the founder of the SBE and former technical editor of Radio magazine. Click here to view a video of the tribute. Visit the John Battison tribute page on the SBE website to find out more about his legacy. The SBE would like to ask those who knew SBE founder John Battison to share fond memories, favorite personal stories, or comments about how John shaped the SBE and the broadcast engineering industry as a whole, in the comment section below. The society will honor Battison, known as Member #1, during the SBE National Meeting in Denver, Colorado, October 23-24. The founder of the Society of Broadcast Engineers, John H. Battison, P.E., CPBE, who passed away on Aug. 28 at the age of 96, is being memorialized with the creation of a scholarship in his name. The John H. Battison SBE Founder’s Scholarship will be presented to an applicant who seeks to enter or advance in the field of broadcast engineering. This decision comes today, on what would have been Battison’s 97th birthday. The Ennes Educational Foundation Trust, the non-profit, charitable arm of the Society of Broadcast Engineers, is adding the scholarship to several others it already awards annually. The new scholarship recognizes the instrumental role Battison played in the formation of the SBE. It was Battison’s vision for a professional organization dedicated solely to the broadcast engineer and his personal efforts to invite station engineers from across the U.S. and Canada to join, that resulted in the organization of the SBE in 1964. Battison served as the new organization’s steering committee chairman and then as its first president. “No one person has done more towards advancing the broadcast engineering profession than John Battison. The Ennes Trust is pleased to honor the memory of the founder of the Society of Broadcast Engineers with the creation of this scholarship,” said Ennes Trustee, Fred Baumgartner, CPBE. Applications for the John H. Battison SBE Founder’s Scholarship will be available by October 1, 2012 and can be obtained on the SBE website, www.sbe.org. The annual deadline for all Ennes Scholarships is July 1 with the announcement of the recipients made by the end of July. Those wishing to make a contribution to the John H. Battison SBE Founder’s Scholarship fund may send donations to: Ennes Educational Foundation Trust, 9102 N. Meridian Street, Suite 150, Indianapolis, IN, 46260. Checks should be made payable to: Ennes Educational Foundation Trust and write “Battison Scholarship” on the memo line. The Ennes Educational Foundation Trust is a 501(c)3 charitable organization. Contributions by individuals are tax deductible. View a video of SBE Founder John Battison P.E., CPBE, speaking with SBE President Vinny Lopez, CEV, CBNT, at the 2011 Membership Meeting in Columbus, Ohio. John was honored with the re-naming of the SBE Lifetime Achievement Award to the John H. Battison Award for Lifetime Achievement in April 2011 after receiving the award himself in 2006. The Society of Broadcast Engineers mourns the loss today of its founder, John Battison, P.E., CPBE. Our sympathies are extended to his wife Sara, daughter Victoria, son Mark the entire Battison family and his many friends and colleagues. John’s dream to form an organization devoted solely to the professional development of broadcast engineers and the field of broadcast engineering was realized far beyond what he had imagined. For more than 48 years, the organization, which was fueled in its early days by his vision and passion, has positively affected the lives and careers of thousands of men and women who have made broadcast engineering their career. All of us, who have benefited from our affiliation with the SBE during our careers, owe a debt of gratitude to SBE Member #1, John Battison.